11th September. Posted in News. 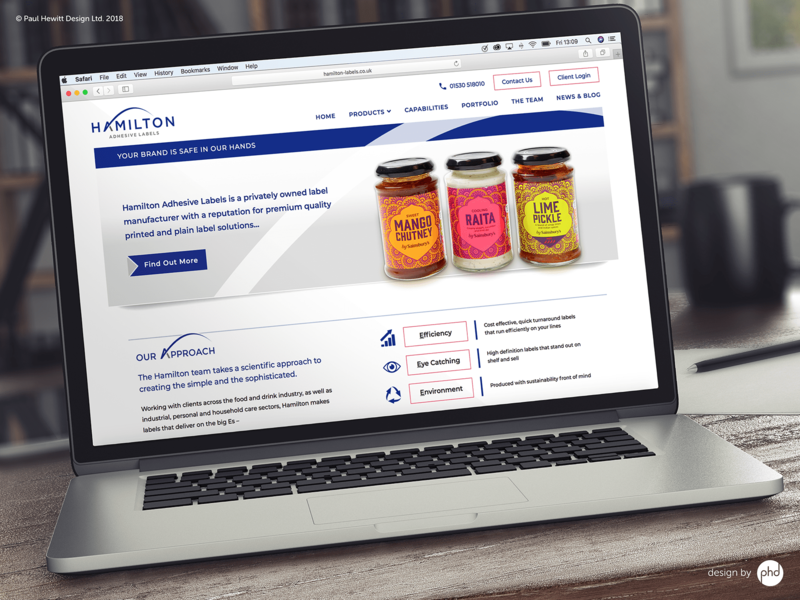 Hamilton Adhesive Labels, a leading UK manufacturer of multi-colour printed and simple plain labels, has unveiled a dynamic new website in support of its exciting business developments. Launched on September 6, 2018, the website offers quick and easy access to essential information with its convenient navigation and engaging content, showcasing Hamilton’s industry-leading expertise. The company has gone from strength to strength, with impressive growth reinforcing its position as a leading provider in the UK labels market. To support this growth the company has recently invested in a new manufacturing line to deliver operational excellence and enable the business to offer the fastest, most efficient inline plain label production capability in Europe. Chris Marsh, Managing Director of Hamilton Adhesive Labels, said: “Over the past few years we have embarked on a programme of significant investment, driven by our vision for Hamilton to become the most respected privately-owned label manufacturer in the UK. It was therefore important to develop a modern website that reflects this mission. Content is divided into convenient sections enabling visitors to find exactly what they are looking for, while the website’s up to date responsive design provides an optimal viewing experience across all touchpoints. Established in 1992 in Leicestershire, Hamilton Adhesive Labels has grown to become a leading manufacturer of multi colour printed and plain labels for the food and drink, household, industrial and personal care sectors. I like the valuable information yyou provide iin your articles. I’ll bookmark your weblog and check once more rght here regularly. I’m somewhat sure I will be told lots of new stuff proper here!